A music festival will take place in Whitby this summer with the aim of raising crucial funds for the town’s football club. Headlined by iconic 70’s bands 10cc and The Real Thing, the Coastline Festival will take place in the grounds of The Stables at Cross Butts in Guisborough Road on August 6. “I’ve played football in charity matches in Whitby and watched the club play, and they asked if I could help put on a memorable event to help raise funds,” organiser Dennis Hobson said. “The club is situated in a difficult location and having a tough time at the moment on the pitch. “Through my friendship with their chairman Graham Manser I fully understand the financial difficulties the club faces in their huge journeys across the country and the costs that they incur in the Northern Premier League. Hobson’s company, Dennis Hobson Promotions, has been involved in promoting boxing shows across the globe in the past, working alongsde names such as Ricky Hatton and Amir Khan, as well as staging numerous music events. “I’ve organised various charity fundraisers in Sheffield, where we’ve had the likes of Bryan Adams and Peter Kay, so I suggested doing a family fun festival,” Hobson continued. “We are delighted to have assembled some wonderful people to make it happen, and the very best venue. “John Morley and his family at The Stables have been truly amazing in their support for the venture and enabled us to get it moving. The club’s finances have taken a hit in recent times, particularly last month when the money-spinning Easter Bank Holiday visit of North East rivals Darlington was postponed and rearranged for a significantly less lucrative Thursday night. With the Blues’ coffers in need of a boost, Town chairman Graham Manser spoke of his delight following the confirmation that the festival would take place. “We are very grateful that Dennis Hobson and Graeme Hinchliffe have decided to get involved and do something to help Whitby Town FC, it’s smashing news,” he said. “This event will move the club to a different level in terms of fundraising and also raise our profile. “We want as many people from across the area to come and join us in 70s fancy dress (optional) and join in the family fun. 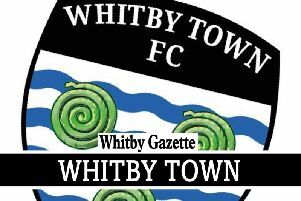 “Already the ticket lines have started buzzing, which is very comforting for Whitby Town FC. Graeme Hinchliffe, a Whitby Town fan and a company director of Dennis Hobson Promotions, was on hand for the festival’s official launch event at The Stables. “The atmosphere is going to be fantastic, it’ll be a lovely day for the family, starting at 1.30pm and will also go on into the evening,” he added.